So last Tuesday marked the end of the Video Production module which we took as a humanities elective for the third semester. The end goal of the module was to produce a 20 min documentary on a subject matter we chose initially. For this, we learnt of the thinking process that goes behind the making of documentaries and movies in general as well as techniques used when shooting the documentary. However this post is not about the module nor the documentary we made (which is still work in progress 😛 ), but about something our lecturer, Mr. Ravin drew our attention to. The Tuesday before last, we had our edits of the documentaries critiqued by Ms. Anoma Rajakaruna, a distinguished documentary maker. An interesting outcome of the critique was that the documentary which had the highest production quality and which was near completion (none of the other 3 were at least half done) was criticized for being a TV programme and not a documentary. This comment popped up again during the last class and the group which did the documentary asked Mr Ravin about his thoughts on it. His reply was that the group held on to the footage they captured, displaying such a blind and foolish devotion, that they let their awareness of the task at hand slipped away. His point was that because they couldn’t let go of the attachment to the footage they worked so hard to capture, they lost their “awareness” of the end goal, there by turning out a sub-par product. He went on further, explaining to us something he learnt from a Japanese monk. The beauty of this is that it captures the essence of some of the core Buddhist teachings in an elegant and simple manner. Given below is the diagram he used to explain it. Consider the above as a balance. 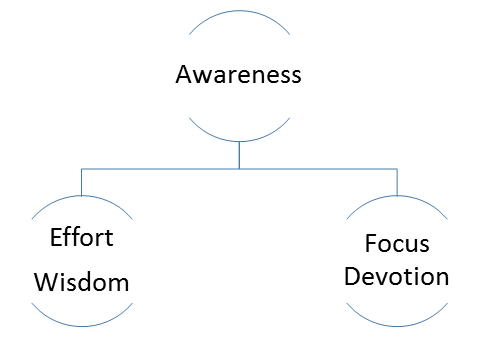 The moment you lose awareness when practicing any of the 4 values mentioned, the balance goes out of balance. Effort in the absence of awareness, turns in to rage/aggression. No matter the amount of effort you put in, without awareness, it will be in vain. Wisdom in the absence of awareness, turns in to cunning/deceit. Focus in the absence of awareness, turns in to laziness. Devotion in the absence of awareness, turns in to foolish devotion. This is where one would follow anything for the sake of doing so, without giving any thought to the reasoning for doing or not doing so.